IN THE FRENCH ALPS CLOSE TO GENEVA, ANNECY AND MONT BLANC. The last piece of the puzzle is in as we are thrilled to add the great Della Mae to our programme for 2019. This completes an amazing festival line up along with our other headliners that include Boston based Mile Twelve (also teaching at the 3-day camp before the festival), North Carolina bands Tellico and Lover's Leap, with Billy Cardine of Rapidgrass, (also teaching at the camp), Blue Summit from the Bay Area of San Francisco and the great country star Whitney Rose, at La Roche Bluegrass Festival for our Sunday evening "close but not quite bluegrass" slot! From Europe we have the talented British multi instrumentist Ben Somers with this String Band, and last year's contest winners The Often Herd. In line with measures taken throughout Europe on safety in public places, all people coming onto the site will be submitted to a search of their belongings by our security staff. We thank you for your cooperation and your understanding. Having blown everyone away at the 2017 festival, we are delighted to have them back for a one off concert in La Roche. ​Truely one of the great Bluegrass bands currently touring. You cannot miss this! Entrance is free, as always, and we ask for contributions on the way out if you enjoy it. Concert in two parts starts at 8:30 pm. Doors open at 7:30 for sandwinches and refreshments (also available during interval). Enjoy last year's festival again with these slideshows by official photographer Emmanuel Marin and other great photographers who were there. Pictures of the shows and also of vistors and volunteers enjoying all aspects of the festival. See videos with sound taken straight from the sound board featuring Molly Tuttle, Frank Solivan, Rapidgrass. La Roche Bluegrass Festival is proud that Nashville Based IBMA gave its second highest award (after Hall of Fame) to La Roche Bluegrass Festival founder and chairman Christopher Howard-Williams at the International Bluegrass Music Association Awards Ceremony in Raleigh, North Carolina on September 27, 2018. 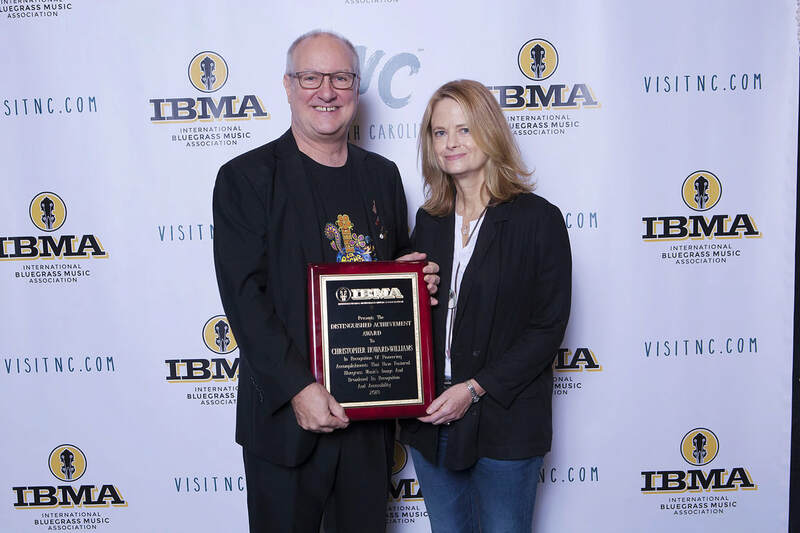 The award was presented by Compass Records founder and CEO Alison Brown, herself an IBMA Distinguished Achievement Award recipient, IBMA Banjo Player of the year and 2-time Grammy winner.